In 2017, Derby’s defense played virtually the entire season with zero returning starters. Multiple key players, including linemen Isaac Keener and Tyler Dorsey and linebacker Jay Fisher were out. The Panthers allowed more than 40 points five times, though posted a 3-2 record in those contests and advanced to the Class 6A state championship game. In the title, Derby lost in the final minute to Blue Valley North, 49-42. Blue Valley North quarterback Graham Mertz, a Wisconsin commit and elite quarterback prospect, had 462 yards of total offense and four scores. The Mustangs finished with 561 yards of total offense. It marked the first time coach Brandon Clark had lost a state title game in his Derby tenure. Overall, the Panthers went 11-2 and permitted 27.3 points per contest. It marked the Panthers’ worst scoring defense since 2010 when Derby allowed 32.8 points a game. “I think a lot has to be said for walking off that state championship field in second place, probably one of the worst experiences that you can experience,” Clark said. This year, Derby returned five defensive starters, all seniors: linebackers Jacob Ormsby and David Sherman, defensive backs Cade Lindsey and Dax Benway and Keener at defensive line. Additionally, standout senior Hunter Igo started part of the year at safety and quarterback. Clark noticed multiple Panthers have significant improvement in the weight room, especially with Dorsey, Lindsey and Fisher. Lindsey has signed with Oklahoma State for wrestling. “After the summer, we kind of knew our defense was going to be our backbone,” Clark said. The changes yielded one of the most dominant defensive seasons in recent Kansas history. The Panthers finished 13-0 and avenged last year’s loss to Blue Valley North with a 24-16 victory in the Class 6A state championship game. Clark is 4-1 in state games in 13 years as Derby’s coach also with titles in ’13, ’15, and ’16. The Panthers allowed just 7.9 points per contest (103 total) and had the school’s top scoring defense since the 1994 state title squad allowed 78 in 12 games for 6.5 a game, according to Kansas Football History. “Playing as a whole, they rank right up there, right up with the 2013 team,” Clark said of a squad that went 12-1, outscored teams 615-172 and led 6A in offense and defense. It marked 6A’s best scoring defense since at least 2006, according to Prep Power Index. “For the most part, it was just our kids’ will, their will to get better in the offseason, and they did that,” Clark said. Derby’s defense encapsulated the 2018 football season. While the year had plenty of surprises, most notably Gardner-Edgerton, Olathe West and Canton-Galva, this fall was led by the best teams. All the state titles were all won by established state powers. Five teams that captured crowns were ranked No. 1 in the preseason. The other three squads were ranked second. Unlike the last two seasons, especially 2016, the state runners-up were, by and large, not surprises. Six of the eight runners-up (Blue Valley North, 5A Wichita Northwest, 4A Goddard, 1A Olpe, Eight-Man, Division I Solomon and Eight-Man, Division II Osborne) were preseason top-five. Northwest opened as the top ranked team in 5A, while Osborne began the year ranked second in Eight-Man, Division II. Only 3A Pratt and 2A Riley County were unranked, though both were considered viable contenders, and Pratt was ranked virtually all year. However, what 2018 yielded was a season of superlatives, especially among the state titlists, non-KSHSAA teams such as Christ Prep Academy, and a record-breaking set of wide receivers. In Eight-Man, Division I, Claflin-Central Plains, like Derby, was undersized and had multiple players back from injury last season. Central Plains had no defensive starter more than 202 pounds. The Oilers allowed just 34 points, the best eight-man defense since at least 2003. Derby, with its family atmosphere that stretches down to second grade football, has continued to beat teams with more Division I talent. In the last three years, 247Sports, a well-known national recruiting service, had ranked 42 high school players as the state’s top recruits. Just one has been from Derby – and none for the Class of 2019. This year, the Panthers defeated Bishop Carroll, Topeka High, Manhattan and Blue Valley North, teams with highly recruited players. Derby has sent multiple players to Division II or NAIA, including six to Friends. Former Panther linebacker Jose Delgado was considered undersized and earned MIAA Defensive Player of the Year for two-time league champion Fort Hays State this past fall. He was an All-American as a junior. “Everybody was talking about all these D1 kids and D1 offers, and we’ve got a lot of kids with D1 talent, but we just don’t have the height and size to play at that level,” Clark said. Igo and junior running back Tre Washington led the offense. Igo is just 5-10, 165 pounds and recently picked up his first offer, from Division II Southwestern Oklahoma. Clark called Igo the team’s MVP. In a rarity, Igo was second team all-league at quarterback, defensive back and returner. He passed for 1,068 yards, rushed for 931 and accounted for 30 scores. Washington led with 1,836 rushing yards. Derby, led by 83 tackles, 25 for loss and 12 sacks from Keener, threatened the state record for fewest rushing yards allowed. Opponents rushed for just 511 yards, 39.3 yards per game and 1.5 yards per carry. Keener, the conference and 6A Defensive Player of the Year, was double teamed most of the fall. Derby, led by defensive coordinator Mitch Pontius, installed some new fronts and looks. Keener, Dorsey, Fisher, Benway (team-high six interceptions) and senior linebacker Jackson Syring were first team all-league picks. Dorsey, considered one of the top linemen in the Class of 2020, had 58 stops, second to Ormsby’s 66 tackles. He finished with 18 tackles for loss, second-best on the squad. Bryce Westmoreland, an undersized defensive lineman, contributed six TFLs and three sacks. Lindsey, Fisher, Syring and Ormsby (honorable mention) paced the linebackers. 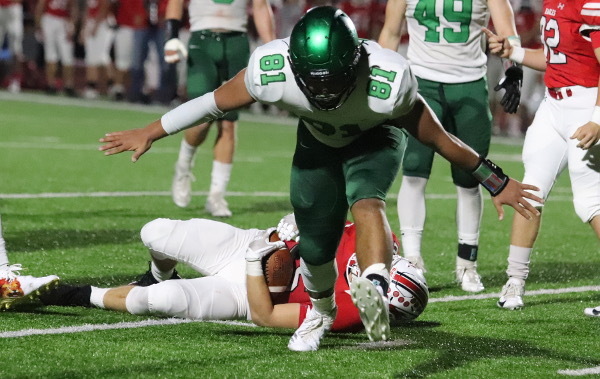 Syring (47 tackles, 12 TFLs) recorded a bevy of honors, including first team all-state linebacker, honorable mention all-state kicker, first team all-state punter, and Derby’s special teams player of the year. Syring was third all-time in Derby single season kicking points. He averaged 36 yards a punt with four field goals and 71 extra points. “One of the best linebacking groups that we have had in a long, long time, maybe ever since I have been here,” Clark said. Lindsey and senior defensive back Migc Aiyanyor collected second team all-conference. Keener and Aiyanyor are both from military families. Keener played at Derby from 2008-11 and was with Derby Junior Football. Keener and his family moved to Maryland and Kentucky, but he stayed close to his former teammates, especially Benway. “Kids are really tight,” Clark said. “They have played together since second grade. Those kids knew each other, trusted each other, and that’s a big part of what we do, is our kids grow up together and they have been playing ever since second grade together. “If you look at our starting defense, that was our starting seventh and eighth grade defense, too, so they have played together for a long time,” he added. Keener moved back before the 2017 season before a terrible injury against Salina Central. Even with the injury, Keener was still a second team selection as a junior. Clark said Derby quickly accepted Aiyanyor, who transferred from Salina Central. He recorded 36 tackles and two interceptions. “Accepted him with open arms and bought into the system, that’s just a tribute to all the kids that have been here before,” Clark said. In Class 5A, St. Thomas Aquinas coach Randy Dreiling had paced Hutchinson to six state titles with his run-heavy, flexbone offense. In his first four seasons, he took the Saints to a pair of runner-up finishes. This year, Aquinas captured its first state title in school history. Dreiling labeled Joe Michalski, an Oklahoma State commit and two-time Top 11 all classes, as the best lineman he has ever coached. It’s arguably the best line Dreiling has ever had with Michalski and Division I prospect Jaeden Roberts. On defense, lineman Javier Derritt has committed to North Dakota State, and defensive back Jayden Russell is a high-level Division I talent. Sophomore Tank Young broke the Saints’ record for rushing yards, set last season by senior Cameron Jackson. He rushed 214 times for 2,075 yards and 26 scores despite just playing in 10 contests. Aquinas delivered 382 rushing yards a game and eight yards a carry. In a tribute to the offensive line, it was easily the Saints’ top rushing attack under Dreiling. Before this season, the best yards per carry and rushing yards per season came in 2015 at 6.6 and 346 yards a game. In Class 4A, Bishop Miege captured its fifth straight state title. The Stags finished 11-2. Miege had an average margin of 45-16. Miege is one off the state mark for consecutive state titles of six set by Hutchinson from 2004-09. Senior quarterback Sam Pedrotti, a first-year starter, capably stepped in for Miege’s long run of record-setting/Division I athletes that included Montell Cozart, Ryan Willis and Carter Putz. Pedrotti operated without Miege’s longtime quarterback coach Justin Hoover, who took the head job at Shawnee Mission East. FBS recruit Daniel Jackson appeared in just one game because of injury, and Ty’quez Agnew-Whitten played in just seven. However, Pedrotti completed 167 of 262 passes for 2,511 yards with a 29/9 TD/INT ratio. Overall, Miege had 194 of 301 passing for 3,017 yards with a 35/10 TD/INT ratio. It marked the most pass completions, attempts and rushes (508) Miege has had in the last five years. In Class 3A, Sabetha captured its fourth title and second in a row after crowns in ’93 and ’97. The Bluejays went 13-0 and captured their first undefeated season since ’93. In ’97, Sabetha went 12-1 and last year the Bluejays were 13-1. Sabetha lineman Elliott Strahm became a rare Bluejay who earned Top 11 honors. In Class 2A, Phillipsburg also enjoyed its first perfect season in school history with a 13-0 mark. Trey Sides, a four-year starter at quarterback, completed one of the more remarkable signal calling careers in state history. Sides, who started on the ’15 title team, lost just two games as a starter in his career, once as a freshman to Sedgwick in the regular season – the last regular season defeat for Phillipsburg - and once as a sophomore to Hesston in the playoffs. He was hurt in last year’s playoff loss to Marysville. Recently, the Kansas Sports of Hall Fame confirmed Jonathan Hunnacutt broke the state record for career kicking points with 263. In Class 1A, Smith Center captured its tenth crown and second in a row. Smith Center tied Lawrence for the most all-time titles. The Redmen turned the ball over just five times all year, and senior Logan Zabel had 149 stops, second-most in Redmen history behind Kerby Rice’s 160 in 2005, according mclkansashighschool.com. In Eight-Man, Division II, Hanover continued its dynasty with its third straight title and bumped its winning streak to 38 contests, the longest run by an eight-man program since Almena-Northern Valley won 41 in a row in the ‘80s. That represents the longest eight-man winning streak in the KSHSAA era in 1969 – a mark Hanover could certainly break next year. Christ Prep Academy (Lenexa) captured the National Homeschool Football Association (NHFA) National Championship for the first time. The Patriots, consistent contenders with recent second- and third-place finishes under coach Tom Hurley, defeated Landmark Christian (Ohio), 21-0, in the title. Quarterback Noah Blair led the team with two scores and finished as game MVP. Christ Prep went 11-2 with losses to Olpe, Kansas’ 1A state runner-up, and Coffeyville, a 4A squad that finished 5-5. In the last month, the Patriots defeated No. 2 Landmark, No. 3 Tomball Christian, No. 4 NOAH (Tulsa) and No. 5 Lighthouse Christian. Christ Prep defeated Tomball Christian (Tex. ), 10-3, in overtime in the semifinals. Blair threw a touchdown pass to Micah Krause. Previously, the Patriots beat rival Lighthouse Christian (Mo. ), 36-14, as Christ Prep forced four fumbles and recovered three, both season-bests. Christ Prep is 6-7 in the all-time series with Lighthouse Christian. Connor Hurley, Ewen Cornstubble, Grant Gilkeson were among those who collected all-star team honors. Christ Prep ranked among Kansas’ leaders in rushing with 579 carries for 2,977 yards. Four players had at least 515 yards, led by 681 from Hurley, a senior. He paced the squad with 97 tackles, 19.5 for loss. Cornstubble and Gilkeson, both seniors, anchored a big, veteran offensive line. Brandon Wise graduated from Derby and opened his career at Central Plains. He was an assistant for coach Chris Steiner on the ’14 state championship Oiler squad. Wise completed his first year as Osborne’s head coach and still remains close to Steiner. Usually on Sunday, they watch film and communicate. Steiner said Wise is “family to us.” Steiner said Wise’s parents never missed a game, except one playoff game to a prior conflict. Wise assisted at Central Plains four years after he played at Kansas Wesleyan. He served one season as head coach at Marais des Cygnes Valley, and then, in an arranged move, spent one fall as an Osborne assistant to Cullen Riner before the pair switched roles this year. Axtell’s Hunter Koch completed a remarkable career with 73 catches for 1,265 yards and 33 scores. He had 2,882 career receiving yards and 63 receiving touchdowns. Koch helped Axtell advanced to the sub-state title game in Eight-Man, Division II. Koch broke the record for single season and career eight-man receiving touchdowns. Additionally, Blue Valley North’s Cameron Burt hauled in 101 catches for 1,838 yards and 21 scores, and set the 11-man single season mark for catches and receiving yards. Maranatha Christian Academy’s Brock West had 60 catches for 1,204 yards and 29 receiving touchdowns. West tied the eight-man state mark for single game receiving scores with eight against Chase County on Sept. 28. West was nominated for eight-man Player of the Year by the National Athletic Association of Private Schools. Wichita Homeschool junior quarterback Will Day was also a finalist.